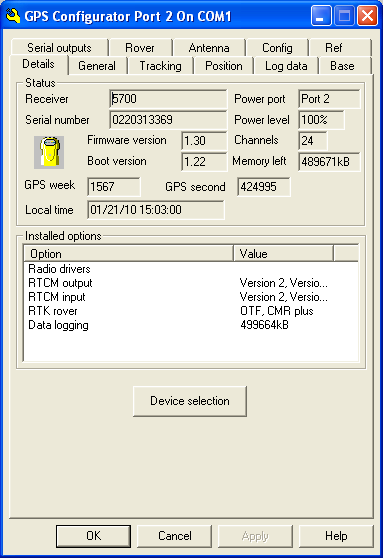 Trimble GPS Configurator software can be used to check the status of a receiver. We do not recommend it for configuring the receiver; to configure a 5700 or R7 receiver, see How to configure the receiver using Trimble Configuration Toolbox software. Power the receiver if it’s not already running. Connect receiver port 2 to your computer’s serial port using a lemo/db9 programming cable. If your computer does not have a serial port, use a USB-serial adapter. Open Trimble GPS Configurator. Select the type of device you are connecting to and the port you are using on your computer. Click Connect. Use the tabs along the top to view different receiver, tracking, and configuration characteristics. Posted by: Beth Bartel - Tue, Jan 26, 2010 at 9:37 PM. This article has been viewed 8198 times. We used this receiver with our OxTS Inertial+ and the results were pretty good. We didn’t have any problem with the receiver tracking. The Inertial+ was able to fill in position when the receiver could make measurements under bridges, trees etc. That’s why we use an inertial navigation system, to get over tracking problems. Works a treat!